106 other birds have this item in their bag or wishlist! I love these Sterling Silver Morning Sunrise Drop Earring from Najo. The turquoise drop adds a touch of class to this boho style. These earrings are stunning, I love them. The quality is fantastic. They came in a lovely NAJO box - would make such a nice gift. Look absolutely beautiful on and comfortable to wear.. a real eye-catcher! Good quality sterling silver and real turquoise stone.. These were a little smaller than I imagined but just as cute. I love the colour! They really brighten up a plain black outfit and I imagine they will look great with white too. Lovely delicate earrings. Will go with lots of outfits. Great quality. Lovely earrings. Exactly as they are pictured & light & comfortable to wear. Love these earrings. They are quite delicate so very versatile. I receive compliments every time I wear them. These are the perfect size for everyday wear while still being slightly different and funky. They feel comfortable and sit well. Love these and will get lots of wear out of them. 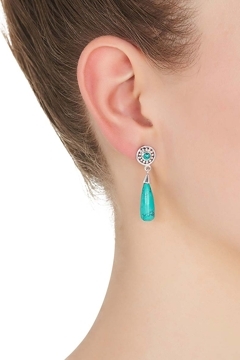 These earrings are dainty and beautiful. They are the perfect size to wear with the big bold silver necklaces, as they will blend and not look as if you are wearing too much jewellery at once. Very comfortable to wear. They are not heavy.